In this Veterans Day, I present this maxi card showing the USS Constitution with a matching stamp and a first-day-of-issue cancellation. It was sent around October 14, 2013 as US-2452560, but went missing along with more than a dozen other cards mentioned in my blog on November 18, 2013. It was kindly registered by the recipient as received when a replacement arrived. The inception of the card was also storied. 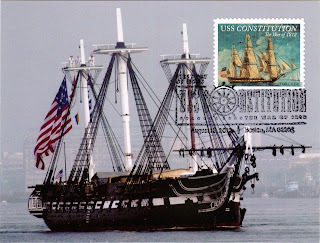 When the USPS issued War of 1812: USS Constitution stamps on August 18, 2012, I decided to request the first-day-of-issue postmark for the first time. 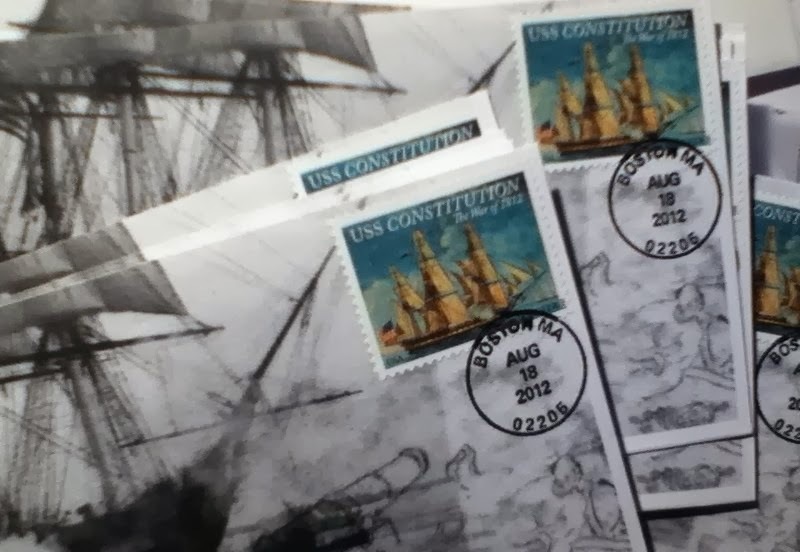 I sent out 20 stamped covers and postcards, along with a self-addressed return envelop with Priority Mail Flat Rate postage, in another larger envelop by Priority Mail addressed to: The War of 1812: USS Constitution Stamp, Postmaster, 25 Dorchester Avenue, Boston, MA 02205-9998. The tracking record shows that it was received on September 17, 2012. 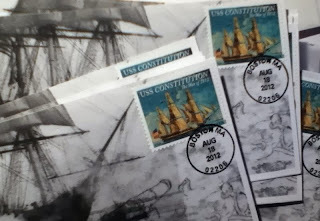 However, when I received my self-addressed Priority Mail envelop from Kansas City, I was surprised to find 30 First Day Covers that was not mine, along with a letter and a return mailing label saying that two of my items were damaged, I could use the free mailing label to resent two pieces of artworks without stamps to get replacements. Someone else's FDCs sent to me in error. So, I returned those FDCs with a letter saying those were not mine, and I was due 20 covers and postcards. So I enclosed 20 un-stamped for them to apply stamps and postmarks. Those postcards were returned after a couple of weeks. The enclosed letter said they wouldn't issue replacement arbitrarily, and I had to sent back damaged cards to get replacement. Hello? did I just send back 30 FDCs that were not mine? Then I realized that if something mixed up at Boston, Kansas people might not have any idea what I had sent in. So I wrote another letter detailing what I sent and when. Only after another round of back and forth, I received all my FDCs and maxi cards after almost six months. The postcard was purchased at Zazzle.